This article is a short summary of F-Zero: GP Legend. F-Zero: GP Legend is a Game Boy Advance game in the F-Zero franchise, released in 2004 and 2005. 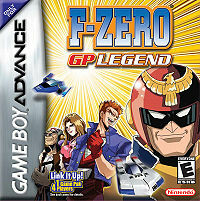 The game is based on the F-Zero: GP Legend anime, and as such takes place in a different continuity from the previously released games. In 2004, F-Zero Climax would be released as a sequel to this game exclusively in Japan. Gameplay returns to the style seen in the original F-Zero, while featuring gameplay elements featured or changed in later installments. This page was last edited on 4 January 2016, at 03:39.